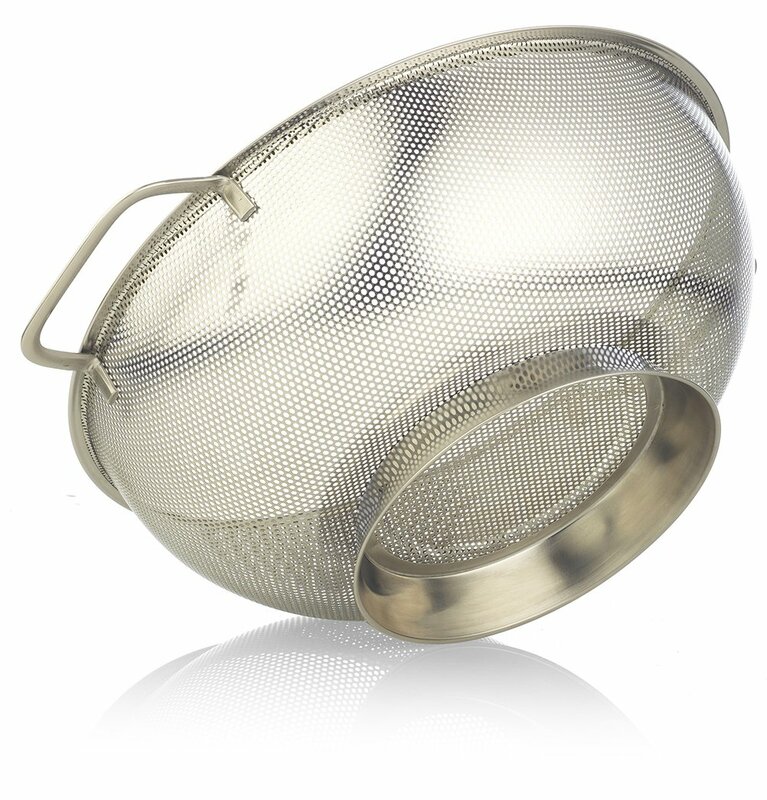 Home › Home and Kitchen › Simplyhomeonline Stainless Steel Colander/Strainer Michael 5 Micro Perforated..
Simplyhomeonline Stainless Steel Colander/Strainer Michael 5 Micro Perforated..
CAN YOU OPERATE A KITCHEN WITHOUT A COLANDER? Have you ever found yourself in the middle of making lunch or dinner for your family, and when you went to drain the noodles, you found out that you have no way of draining the excess liquid. That is the moment you realized that a good, reliable colander is an essential kitchen tool - considering how often you are using it. THE BEST DECISION FOR YOUR COOKING STYLE - Colander Michael 5 is made of high-quality stainless steel, comprised of many very small holes which allow the water to move quickly through the product and to drain small pasta or rice without it escaping through the holes. Strong base allows the product to sit in your sink without tipping over when draining, giving you time or a free hand to work on something else. Ergonomic designed handles are something that will excite you. PASTA STRAINER MICHAEL 5 - Kitchen assistant Michael 5 allows you TO DRAIN noodles, pasta, beans, canned food; TO RINSE vegetables, fruits - like delicate berries, and TO STEAM vegetables. You can simply place it in the dishwasher or wash it by hand. CUSTOMER CARE PROMISE: Simplyhome online offers complete CUSTOMER SATISFACTION, period. Our customers are more important than our sales. If for any reason you are not absolutely happy with colander Michael 5 we will replace or refund your order, no questions asked. CONTACT our friendly customer support directly and we will take care of you. We love to help! SPECIAL BONUS We have a special Surprise for you - a Free Gift microfiber cloth as a Bonus for your strainer Michael 5. Color:Silver No More Loosing Your Spaghetti And Rice Through Big Holes! Ourstainless steel colander is here to keep your meals whole, and your sinksclean! Whether you’re a professional cook, or it’s your hobby, whether you’rea wife or a mother or someone who generally loves to cook, this colander isthe perfect tool for your kitchen!Micro Perforated To Keep Tiny Grains FromFalling Through Now that you use a mesh colander with larger wholes, you knowthat problem; when you fight to balance it over the sink to get rid of all thewater, and trying to save as much as you can from your food.With thiscolander, forget about that! Simply leave it in the sink with the waterrunning, and cut your vegetables or deal with any other thing that needs yourattention. Rinse and drain anything you’d like, from small fruit, meat, fish,vegetables, pasta and rice, or leave anything to defrost in it. Its microperforated style removes all excess liquids from your food, and it’s solidring base will help it stay put and on one level. Keep Your PipesUnclogged!When food leaves your old colander, it ends up somewhere in betweenthe pipes of your sink, and it just keeps adding up. And that, of course,results in them being clogged, and you having to find a plumber to undosomething which isn’t entirely your fault. So Wait No Longer And Get OurMicro-Perforated Colander And Drain Food Easier, Faster And Without LosingAnything Down The Drain. Order Now Before We Run Out Of Stock Again!